Seattle is still the least air-conditioned place in the country for renters, but new apartments built in the last several years are four times more likely to have central air than older ones. As Seattle summers keep getting hotter and hotter, a once-unthinkable perk for renters here has become more commonplace: air conditioning. Traditionally, there hasn’t been much of a point for local developers to spend the extra money to install A/C: Seattle has among the coolest summers in the country, and new construction was rare enough that new buildings didn’t need extras — they stood out just for being new. But now the record apartment construction boom sweeping the city has created what some in the industry have called an “amenities arms race” to attract tenants. Things like rooftop decks, gyms and dog play areas are a dime a dozen. Now A/C has become a way for landlords to stand out in a sea of apartment ads. Before this decade, only 6 percent of all rentals in the Seattle metro area had central air conditioning, according to Census statistics— the lowest rate for any major region in the country. Megan Murphy, a senior manager at one of the biggest developers in town, Paul Allen’s Vulcan Real Estate, said that just a decade ago the company never would have even considered including A/C in its buildings. But now it’s standard for all apartments in Vulcan’s new high-rises, and comes included at many of the units in its smaller projects. Another factor: A/C is standard in a lot of other regions, and with the rise in new residents moving from locales with hotter summers like California, Texas, Chicago and New York, tenants come with the expectation that air conditioning will be included, Murphy said. More Pacific Northwest natives have been asking for A/C lately, as well. She said installing A/C in a building while it’s under construction typically costs $5,000 to $6,000 per unit, costs that are typically factored into rents, whether people use the cool air or not. Overall, new buildings in Seattle have rents that are about 40 percent more expensive than older ones, according to Dupre + Scott. “There have been individuals that we heard that moved into Cascade because it had A/C,” said Bradley Karvasek, senior vice president of development at Equity Residential, which owns the building. The increase in air-conditioned apartments might be more noticeable here, but it matches a similar, nationwide trend: About 82 percent of U.S. rentals built this decade had central air, up from a previous average of 56 percent. The typical U.S. apartment is nearly eight times more likely to have central air than one in Seattle. The planet had its hottest year on record last year, topping 2015, which topped 2014, continuing a warming trend that’s been going on for more than a decade. And while this year has been chilly so far, we’re set for our first heat wave next week — the forecast says it could hit 80 degrees on Tuesday. 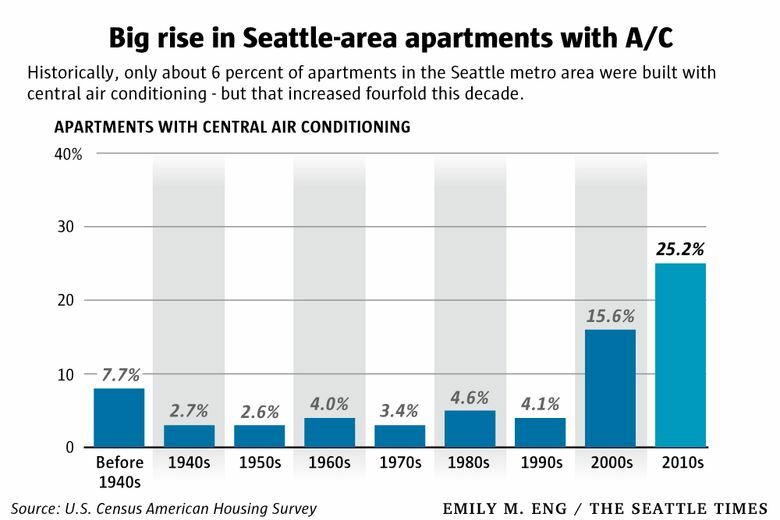 Of course, people in most older buildings that aren’t wired for full central air conditioning can still get cool by plopping a unit in the window or getting some other kind of smaller A/C unit — and the majority of renters in Seattle who have A/C go that route. About 14 percent of apartments in the Seattle region had air conditioners that only cool one room each in 2015, up from 11 percent in 2013. That trend spans apartments of all ages, suggesting that renters are actively seeking out and installing more air conditioning or landlords are retrofitting them with smaller A/C units. Overall, when including all types of A/C, 21 percent of apartments in the greater Seattle region had air conditioning as of 2015, making us the least air-conditioned place in the country for renters, among major metro areas. By comparison, 86 percent of U.S. apartments have some kind of air conditioning. It’s 55 percent in the Portland region and 27 percent in the San Francisco area. What about owner-occupied houses? It’s a similar trend, but A/C is more common in houses than apartments. About 72 percent of local homes built this decade have central air, up from a historical average of 21 percent. Across the country, 92 percent of new homes for sale have A/C, up from 74 percent in older houses.